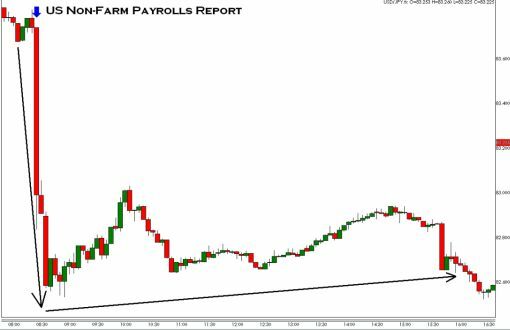 This morning’s stronger than expected ADP report sparked some optimism for tomorrow’s Non-Farm Payrolls release. Over the past 12 months, ADP has consistently underestimated NFPs which means that non-farm payrolls could be much stronger than expected. The current forecast calls for job growth of 105k. 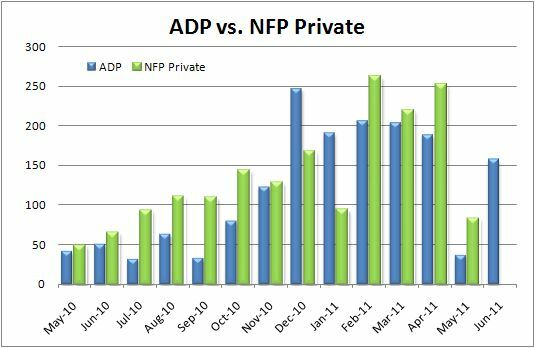 The following chart shows how ADP underestimated Private NFPs 11 out of the last 13 months. What Currency to Buy if Non-Farm Payrolls are Strong? Barclay’s argues that if non-farm payrolls surprise to the upside, the Canadian dollar will be the best performer. How does an investor position for such an upside surprise? The temptation is to be long the USD against a currency with a high sensitivity to US interest rates such as the JPY. However, with the Fed having already stated that it would need plenty of persuading to do anything on monetary policy, USD gains may be somewhat limited. On the other hand, strong US numbers would be good for those economies around the US whose central banks might be more willing to tighten monetary policy. Canada’s economic linkages with the US and the US’s importance in the Bank of Canada’s monetary policy decision making process (as the BoC has reminded us time and time again in its statements) make a long CAD trade attractive from this standpoint. Furthermore, an historical study of G10 currency performance following payroll surprises shows that the CAD has tended to outperform other G10 currencies on upside surprises to NFP (Figure 4). Dollar: How Could it React to Non-Farm Payrolls? 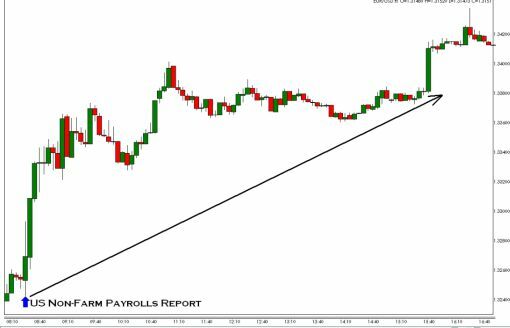 The 580k hyperbolic forecast has caused many foreign exchange traders to position for a very strong non-farm payrolls report. Interestingly enough, the price action in the equity and bond markets indicate that these traders don’t buy the lofty forecast. Most forex traders probably don’t expect such a blowout number but it is reasonable to assume that a large number of those traders expect payrolls to exceed 250k and possibly even 300k. This is the bar that the market will be measuring non-farm payrolls by tomorrow and not the 150k consensus forecast. As in recent months, the private sector payroll number will be more important than the headline but these two numbers are not expected to diverge significantly. We expect the dollar to rally as long as non-farm and private sector payrolls exceed 250k but the extent of the dollar’s gains will hinge upon the strength of non-farm payrolls. Anything short of 250k will probably leave the market disappointed and a number weaker than 150k will cause the dollar to fall. The non-farm payrolls report is a notorious for triggering sharp volatility across the foreign exchange market and we don’t foresee a scenario that will leave the dollar unchanged post NFPs. As usual, USD/JPY will have the cleanest reaction to the non-farm payrolls report while high beta currency pairs such as the EUR/USD, GBP/USD and AUD/USD will respond to risk appetite. It will also be important to watch for revisions – the November number was surprisingly weak which means an upward revision is possible. Living up to its reputation, the non-farm payrolls report triggered sharp volatility across the financial markets. The U.S. dollar dropped below 82 against the Japanese Yen while the EUR/USD climbed within 15 pips of 1.40 against the euro on the heels of the NFP release. According to the latest labor market report, American workers continued to lose jobs with non-farm payrolls falling by 95k in the month of September. Thankfully private sector payrolls did not fare as poorly with 64k jobs added last month. The unemployment rate remained unchanged at 9.6 percent. The U.S. government cut jobs more aggressively than the market anticipated and because of that the dollar fell sharply against all of the major currencies. However with a large upward revision to last month’s private sector payrolls number, the non-farm payrolls report is not nearly as negative as the headline number suggests. The most important takeaway from this morning’s release is that the Federal Reserve still has a very difficult decision to make in November. Fed President Bullard was the latest FOMC member to say that “more easing is not obvious.” We are beginning to see more and more policymakers on the fence about starting a new asset purchase program which is positive for the U.S. dollar. Over the past few weeks the dollar has become extremely oversold and any apprehension by the Fed will make short dollar traders anxious. It also doesn’t help that European officials are starting to become worried about the strength of the euro. Shortly after the payrolls report, Jean-Claude Juncker, the head of the euro-area Finance Ministers said the euro is too strong and the dollar is not in line with fundamentals. He is one of the first high level European official to express concerns about the rapid appreciation of the euro and his timing is perfect because the EUR/USD has become extremely overbought. However he was not completlely transparent because he also said that he would invest in the euro at 1.40. Interestingly enough, Junker believes that the Yuan is overvalued and he is not happy with their exchange rate. This is important because it suggests that the Europeans will have a hearty debate on whether they should back the Americans or the Chinese on currency reforms. At the end of the day, the upcoming IMF and G20 meetings should lead to some profit taking in the EUR/USD but that does not mean the downtrend in the dollar is over. As long as the Federal Reserve is still considering easing monetary policy, investors will have little reasons to buy dollars. Don’t expect the dollar stabilize until Treasury yields stop falling. The U.S. dollar skyrocketed after the stronger than expected non-farm payrolls report. Not only did the headline number surprise to the upside, but private sector job growth beat expectations with the July figures also revised sharply higher. This positive non-farm payrolls number will bring relief to both the currency and equity traders and suggests that September may actually be a good month for the financial markets. Given the global impact of the U.S. recovery, everyone around the world will be cheering this report. Non-farm payrolls fell by only 54k in August, compared to the forecast for 105k job losses. The July figure was revised higher from -131k to -54k. Private sector payrolls rose 67k against a 40k forecast with the July number revised up from 71k to 107k. Excluding Census workers, August payrolls increased by 60k. Cutbacks forced government workers to slash 121k jobs last month but U.S. corporations picked up the slack. The only black mark in the report was the unemployment rate which rose from 9.5 to 9.6 percent. Although this was the third consecutive month that more jobs lost than acquired, this is the best outcome that investors could have hoped for. The stronger non-farm payrolls report will reduce the pressure on the Federal Reserve to implement additional Quantitative Easing and practically guarantees that the central bank will make no new announcements on Sept 21st. Central bank officials will be able to enjoy the Labor Day holiday with a lighter heart knowing that the labor market is moving in the right direction. It is no secret that U.S. corporations are flush with cash and the non-farm payrolls report suggests that they are beginning to spend their money by increasing their workforce. The sustainability of the improvement is important but the August number along with the July revision already indicates that job losses in the third quarter was not as bad as previously feared. As long as the non-manufacturing ISM report at 10am NY Time is not horrendous, we expect the U.S. dollar to hold onto its gains against the Japanese Yen and the EUR/USD and GBP/USD to remain firm as long as equities trade higher during the North American session.